At this year's FABTECH in Las Vegas, Nevada, the presence of the German tube bending machine manufacturer Schwarze-Robitec will be dedicated to customer service. After reorganizing its marketing management division in the spring of 2016 and the subsequent focus on international markets, the ITA (International Tube Association) member plans to expand further its services at their US site in Michigan. From November 16 to 18 visitors are welcome at booth N7100 where they can also find out more about the new CNC 80 E TB MR with optimized cutting tool. The tube bending machine manufacturer offers customers from the automotive industry faster cycle times, reduced set-up time, and flexibility. Since last year's opening of the US subsidiary Schwarze-Robitec America Inc., the team has worked continuously together with experts from Germany in order to expand its services. "To support our customers in key markets of the US, Canada and Mexico even better, and to supply them with spare parts, we are expanding our network of experts and increase our storage capacity in the US", says Bert Zorn, Managing Director of Schwarze-Robitec. The focus is on the individual customer's benefits. "Whether in the area of installation, service or maintenance – regardless the challenges our clients have ready for us – our teams of experts know the customer's needs, and our global network allows us to act quickly", said Zorn. The high-performance tube bending machine CNC 80 E TB MR will be displayed at FABTECH. 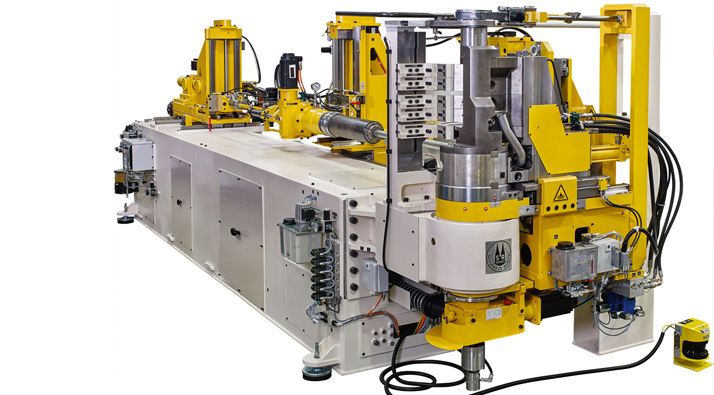 This machine was developed for the series production of tube systems, commonly used in the automotive industry. The machine is equipped with innovative tool solutions and was developed in close cooperation with the customer. A disconnecting device integrated into the bending tool makes it possible to bend and separate tube components at random lengths in a single step. The user's benefits: a decrease in scrap material up to 90 percent and clearly reduced production times. An additional highlight of the machine is the intuitive CNC system. During the implementation of the current process, the system prepares already the next step and thus offers the most efficient operation.